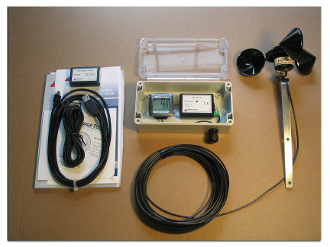 This data logging kit is intended for field-based monitoring and storage of wind speed data (does not include wind direction). The kit includes anInspeed Vortex Wind Sensor with 25 feet of wire (more on request), aMadgeTech Pulse101A battery-powered data logger, download software and cable, and a weather-proof enclosure for the data logger & display. The data logger includes a battery that will last up to 10 years (click here for more information on battery life). Collect and store 500,000 intervals of wind speed, download it with ease, and view it with MadgeTech software.